This year’s turkey day match up is a meaningful showdown between playoff bound teams who’ll be fighting for the top spot in the NFC North. 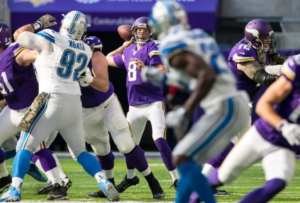 The Detroit Lions will host the Minnesota Vikings in their traditional Thanksgiving Day contest that should draw lots of fan and media attention while American chow down on their annual festive meal. And they have a lot to be thankful about because this game should provide for lots of entertainment, since Detroit has won five of its last six games and has been surging to the top of the division. Minnesota is playing well too since they snapped their four-game skid last week and are gaining confidence and momentum as they regain form. If the last time they met is any indicator of the type match we can expect, it should be an exciting and close game. Back in Week 9, the Lions beat the Vikings 22-16 in overtime as Matt Prater made a game-tying 58-yard field goal at the end of regulation. Matthew Stafford hit receiver Golden Tate for a 28-yard touchdown in overtime. The late-game hail marys were nothing new for the Lions, who have had all 10 of its games decided by seven points or less. Believe it or not, six of their wins came by a total of 24. So tonight should also be a close one. “I think they’ve done a great job at the end of ballgames, including the one we played,” Vikings coach Mike Zimmer told media. “The biggest thing is once you start winning, you develop confidence, and that’s what they’ve done at the end of ballgames.” Minnesota’s confidence is rising after it was going downward after four straight losses before finally hanging on for a 30-24 home win over the Arizona Cardinals on Sunday. The Lions are coming into this game as 2.5-point home favorites over their division rivals, and as of Wednesday late afternoon that line hasn’t changed. The total sits at 43, and was bumped up from 42.5 on Monday. So this could be a tough bet to make. Detroit is excited to play because they know they can win. Their standout cornerback Darius Slay, can’t wait to play on Thanksgiving since he knows there is a lot at stake, for a change. The Lions have been participating this featured holiday game going back to 1934, but more than tradition it will be very important to win since it will boost them in the standings, unlike many matches over the past two decades. Detroit and Minnesota have the same record of 6-4, and it’s the first time the Lions are in first place on the holiday since 1993, which also is the most recent year the franchise won a division title. So the numbers are leaning in Detroit’s favour. Another reason this game is important is that if the Lions beat Minnesota for the second time this season and sweep the season series, they’ll win the head-to-head tiebreaker if both teams are tied at the end of the regular season, and that’s an advantage they want to have in their pocket. If the Vikings can win, they’ll move into first place with a really nice schedule lined up ahaed of them that includes only one team that currently has a winning record, so they could cruise through. “I don’t necessarily think this is necessarily for the division championship,” Minnesota coach Mike Zimmer said. “It’s not like it’s the last game of the season.” It might not be for a division championship but it surely will feel like one. The Vikings winning last week makes this game a lot harder and very complicated to predict. If they had they lost, it’s easy to pick the Lions, but the Vikings have started to play solid football last week, and that’s the type of play that won them the first six games of the season. If the Lions want to come out of this game with the win, they’re going to have to not make many mistakes and turnovers on offense. Turnovers really are the lifeblood of this Vikings team, and so if the Lions turn it over too much, like they did last week against the Jaguars, the Vikings can steal this game. Since making the same mistakes against the Vikings, means big trouble for the scoreboard. Detroit does not want to make this a marquee game that sets Minnesota back on the road. In such a holiday game the advantage tends to go towards the home team and since the Lions are coming into this game with a lot of confidence, they won’t panic if they get down in the fourth quarter. They’re going to have a little more edge in this game, but if the Vikings find a way to take the lead and finally win this game, no one will be suprised.